Check out this beautiful Townsend, TN log cabin. With one private bedroom and an open loft, this cabin can accommodate up to 4 guests comfortably. 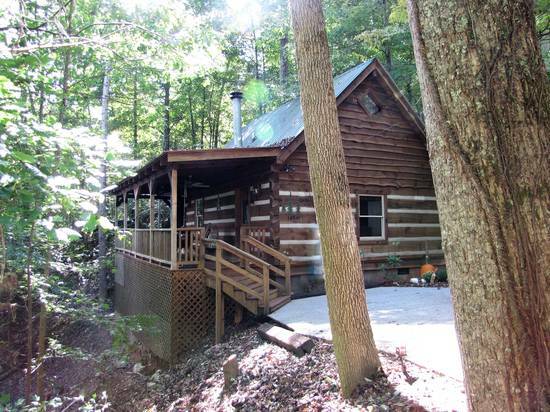 Located in a small log cabin community, this cabin sits on it's own driveway on a hillside and is secluded. Mountain Adventure is especially cozy with a wood fireplaces, a charcoal grill, a gas firepit and a covered hot tub for your enjoyment. Please note that this cabin does have a steep driveway. It does NOT require a 4 wheel drive vehicle except in ice or snow conditions. Very nice cabin. Close by Cade’s cove and other adventures in the park. Very quiet area fairly well maintained. Shower quite small but functional. The pool for the complex was clean and good to cool off on a hot day. We loved our stay at mountain adventure! The location was wonderful. Mountain adventure was warm and inviting. We especially loved taking advantage of the fire pit and free movies on tv in the evenings. While we did not cook in our cabin, we had everything we needed for breakfast and snacks. Our only complaint about Townsend would be the cell phone service and mountain adventure took care of that problem with superior WiFi service. The most convincing part of the reviews of mountain adventure was the number of reviewers who said they would stay there again. My wife and I also hope to come back to Townsend TN and Mountain Adventure in the future. Fantastic stay! It was really nice. We really enjoyed staying there. 'Mountain Adventure' was the perfect cabin for our family of four. The location is excellent and the setting is lovely. The hot tub, porch and fire pit were a hit. The swimming pool down below was an added bonus. The twin beds in the upstairs loft was perfect for our 11 and 8 year olds. We had a marvelous stay and will definitely make plans to return! This cabin is the second we have rented from Smoky Cabins. They are a great company to work with. This was a great cabin. It had plent of towels and extras that were very nice. The drive up was a little steeper than I thought it would be but once there...we loved it. We enjoyed our stay very much and will rent from this company again. The mattress was extremely comfortable! This was the PERFECT vacation!! The cabin was in a great location for privacy and a wilderness feeling yet close enough to everything we enjoyed. It wax homey, warm, inviting...I will definitely stay here again. Great! Had a wonderful time! Daughters birthday weekend with her friend and my wife! Loved the cabin! My boyfriend and I had a wonderful 5 night stay for our anniversary. Everything was perfect and clean. The bed was super comfortable and we enjoyed the hottub and jacuzzi so much. We will definitely be staying again!! We stayed here for four nights during a race weekend and had a wonderful stay. The cabin is clean, well-maintained, and perfect for a quiet getaway. We had one very minor issue with the grill, which was resolved within hours. I cannot recommend this cabin or Smoky Cabins highly enough! 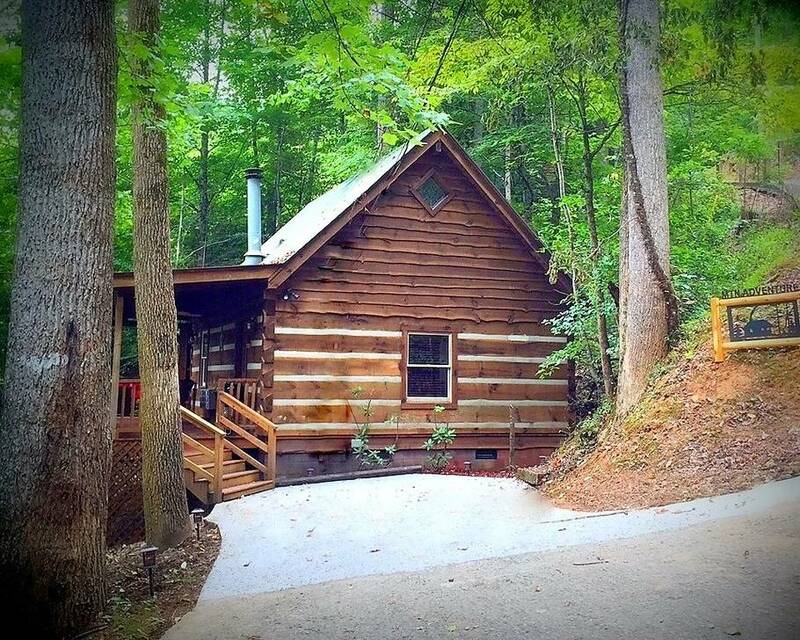 Great weekend, Great cabin, Great experience with Smoky Cabins. Thank You. We thoroughly enjoyed our stay the cabin was very nice and we needed the peace and quiet . We r planning our next trip will stay with y’all again. Thank you !!!! Mountain Adventure is a cute little getaway cabin. My husband & I wanted some rest & relaxation as well as time to leisurely explore. The Townsend area was PERFECT for both!! We loved the amenities that allowed us to cook in the cabin, enjoy beautiful views, while still giving us the privacy & peace we desired. The cabin being decorated for Christmas was an added bonus & just a fun way to continue our holiday enjoyment even away from home. The cabin was clean, well maintained, and had everything we needed. We will definitely be returning & using this rental group. They have taken great care of us & show they care by how they serve & care for their cabins. The cabin was awesome. Our family enjoyed it very much. We have two boys and they loved the loft. It was super preacful and the view was amazing! We would rent Mountain Adventure again. Excellent place to get away from the hussle and bustle of everyday life. Great views of the mountains and surrounding areas. What a treat!!! We loved the cabin!! We LOVED our vacation in your cabin. It was clean & very homey! My favorite part was the front porch swing how amazing it was to just sit & relax. House was stocked with everything we needed for cooking/drinking. Everything was so clean and absolutely perfect for a weekend getaway! Will definitely be coming back soon, and will only rent through Smoky Cabins when we do. The cabin was amazing. We loved the bear decor. The location was perfect. We loved the cabin and the relaxation we got to enjoy! The location was very quiet and peaceful! The fireplace and hot tub were great!! We will definitely be back as soon as possible! We had a really great time at Mountain Adventure. The cabin had everything we needed. We have stayed at Smoky Cabins since 2002 and have always had a wonderful experience. Cabin was great. Very clean and nicely decorated. The cabin was very clean. We have stayed in other cabins and found cobwebs. Not so in this case. It also was stocked with everything we needed. We really enjoyed our stay. Very quiet and peaceful!! Will visit again! !